Hi all, I hope everyone had a great Easter and got to enjoy some time off. We just got back from a mini break with the family. 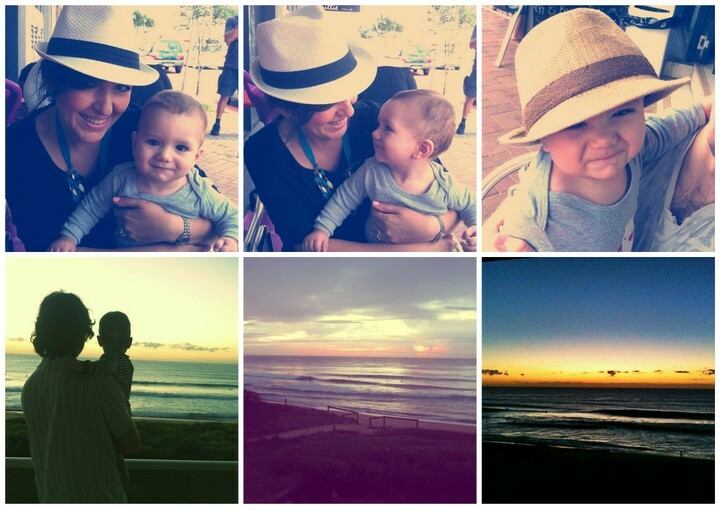 We'd gone up to Sydney's northern beaches for the long weekend and had an absolutely wonderful time. Let me tell you that holidaying with an almost 9 month old is much much much easier than holidaying with a 5 month old. Luca loved being out and about every day, taking in new sights, meeting new people and trying new things (such as dipping his toes in the freezing water). Despite taking my camera with me I didn't really take many photos, instead relied on my iPhone to capture favourite moments. I haven't had a chance to respond to any of my emails or comments, so if you're waiting on an email from me, it's coming, I promise :) First I need to get through the mountains and mountains of washing! PS: Can you believe Luca is almost 9 months old now? Crazy! Time sure does fly. Beautiful pictures. Love his cheeky adorable smile. Time sure flies. My older daughter is 7 and my baby is 14 months. It is scary to think about it! Happy Easter! Thank you, it was very relaxing which was not expected with a baby in tow!